As part of its ongoing growth plans, Briggs Marine Contractors has made a six-figure investment into its diving division’s capabilities with the purchase of a dual basket diver Launch and Recovery System (LARS). The system, which was manufactured by Submarine Manufacturing Products Ltd (SMP), comes as Briggs experiences increased demand for safe, high quality and compact diving solutions. It has been built and maintained to International Marine Contractors Association (IMCA) guidelines and has been certified by Lloyds Register. The SMP dual basket LARS allows the safe launch and recovery of up to two working divers and one rescue diver, in depths of up to 50m. 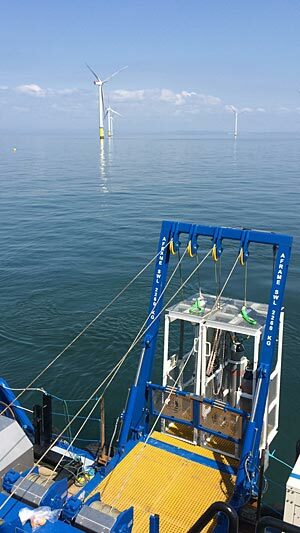 The new system was immediately employed on an offshore renewables project, with teams of divers working around the clock in depths of up to 28 m to facilitate replacement of an inter array cable. “The equipment enhances the modular dive spreads owned and operated by Briggs, and means that bespoke solutions can be rapidly prepared according to each client’s specific requirements; from quayside, near-shore or offshore solutions, domestically or abroad,” adds English. Briggs Marine Contractors is headquartered in Burntisland on the Firth of Forth in Scotland, with marine diving bases in Aberdeen, Burntisland, Immingham, Liverpool, the Thames and the Solent. The company also has a footprint in the Falkland Islands, maintaining a diving capability complete with an IMCA compliant hyperbaric chamber, in a constant state of readiness.